Kinesiology is the scientific study of human movement and its impact on health, society, and quality of life. CSU Bakersfield offers a Bachelor of Science (B.S.) Degree in Kinesiology. The Kinesiology major provides a broad knowledge base in human structural features and maturation. In addition to a strong knowledge base the Department strives to implement real-world applications and build a strong sense of community. 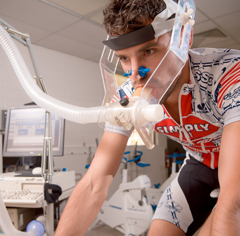 Students can choose a concentration in Applied Exercise Science, Physical Activity Leadership, or Allied Health. The Kinesiology department also offers a minor in Kinesiology, and a variety of activity courses that provide recreation and fitness opportunities for all CSUB students.. Please click on the links at left for more information about the Kinesiology Department at CSUB. The Kinesiology program gave me the knowledge and support to pursue my life long career. I have met the best professors who care about the students, and many students who have become close friends.